Just when you thought all the lavender fun was finished for the summer – you were wrong. If you missed the Lavender Festival, or you prefer to avoid a crowd in Sequim while still enjoying the fields of lavender colored – well, lavender, join in the Tour de lavender, a cycling event with rides for every skill level and interest. The Tour de Lavender takes place August 3 & 4, 2013. If you are a serious cyclist, looking for a dynamic and challenging ride, try the Metric Century Ride from the Kingston-Edmonds Ferry to Sequim. For families and recreational riders, enjoy a family fun ride thorough the lavender farms of Sequim. Read more about each of the routes below. This is a classic long distance ride, taking place on Saturday, August 3, 2013. It will have all the technical support needed for a ride of this distance. The route will travel on back roads and the Olympic Discovery Trail with only 3 miles on Hwy 101. Our Olympic Discovery Trail is a very important part of this ride. A part of the Olympic Discovery Trail in Sequim. Part of the route for Tour de Lavender. The ride organizers have plans that include options for luggage delivery from the Ferry to Sequim local lodging, transportation to the Ride the Hurricane event on Sunday, and/or rider and luggage return to the ferry on Sunday afternoon. The entry fee is $40 per person. See the Tour de Lavdender website for more ride plans and packages. This family cycling tour is designed for parents and children of all ages and abilities on Saturday and Sunday, August 3-4, 2013. This is a relaxed trip for spouses or partners, kids, and even babies in “carriers,”or agile grandparents to visit welcoming lavender farms on the back-roads of the valley in what is a mostly level and easy route. 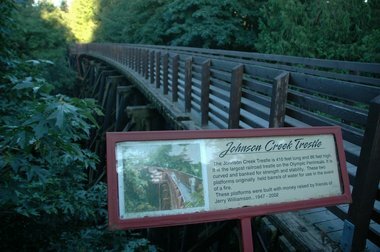 Riders are encouraged to ride the Olympic Discovery Trail. Each of the five lavender farms on the ride will have special attractions for families. 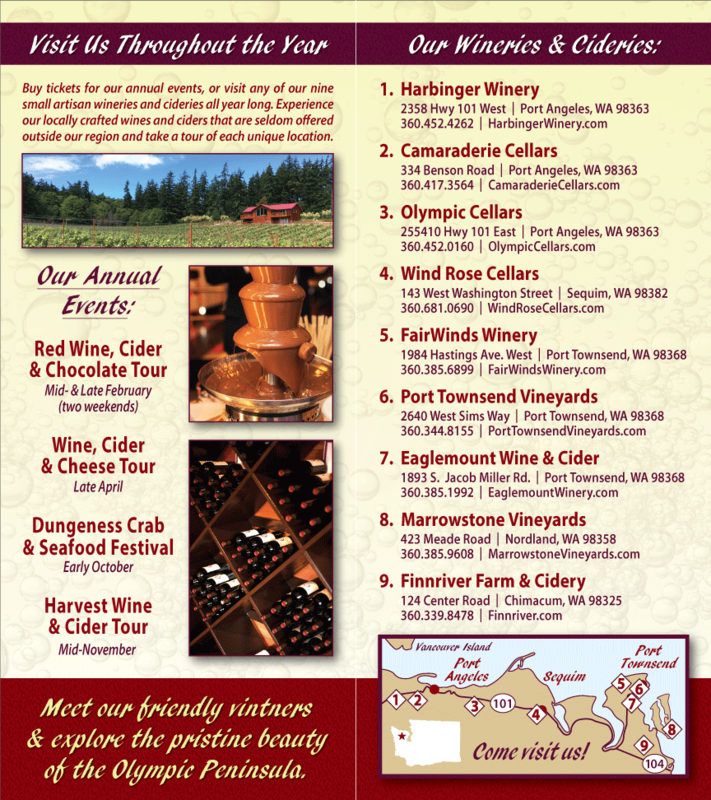 This is a great reason to visit the Olympic Peninsula and enjoy a little wine tasting along the way! Looking for a great weekend getaway this spring? Come to the Olympic Peninsula! Along with charming waterfront communities and beautiful landscapes, we also have natural hot springs. There are two different places where you can bathe in Hot Springs on the Peninsula. One is easily accessed and built up into a resort style destination. The other requires about a two mile hike into the woods and is significantly more rustic. 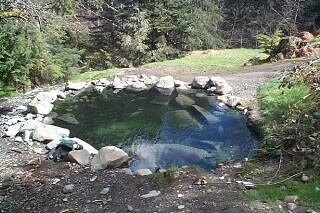 Sol Duc Hot Springs offers three mineral hot spring soaking pools and one freshwater pool. Temperatures vary between the pools, so you can find the perfect one for you preferences. Relax and soak in the hot mineral baths, then jump into the cool freshwater pool for an exhilarating experience! Each mineral pool is closed twice daily to allow for a ‘resting period’. During this time the pool is being tested to ensure health and safety requirements are met. All of the mineral hot springs are drained nightly, cleaned and then fill again naturally. Note: These pools frequently fail water quality standards for public bathing, so use them at your own risk. That said, I’ve bathed in them, enjoyed it and I’m still here, no worse for the wear. There was once a hot spring resort tucked deep in the Olympic Mountains. It burned to the ground in 1940, but of course the springs remain. The road that led to the resort is now a pleasant 2 + mile hike. The Olympic Hot Springs consist of 21 seeps on the bank of Boulder Creek, a tributary of the Elwha River in Olympic National Park. Water temperatures vary from lukewarm to 138 degrees. Most of the springs have been modified by bathers in some way – lined with stones to help collect water into deeper pools, or dug out a bit to let you soak more of yourself in the waters. Hot springs were heralded as healing places at the turn of the 19th century. Many still believe they hold curing properties. But what we know for sure about natural hot springs is that they are relaxing. A little wine while cooking dinner, after a hard day at work or while socializing with friends is also a lovely way to relax. We hope when you visit the Olympic Peninsula, you will stop by one of our fine wineries and bring some Washington wine home with you. If you want to experience the isolated and dramatic Olympic Mountains, your visit will be incomplete without a visit to the remarkable and rare Hoh rainforest. On the west slopes of the Olympic Mountains lies a misty and moist landscape of giant, big leaf maples, and a vast variety of shrubs and flowers. The weather systems coming out of the Pacific Ocean make this area a temperate rainforest. In the summer months of July and August and into September, little moisture is available for this dense forest. 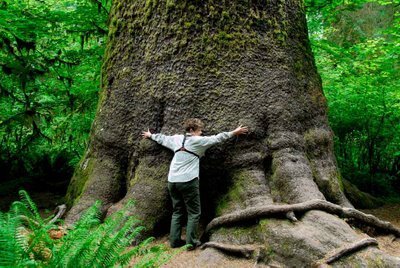 The Hoh forest receives the bulk of its moisture in the winter months, with constant rain and thick mists –up to 140 or more inches a year. These conditions are ideal for Douglas fir, western hemlock and Sitka spruce. Within a fairly narrow range of the rain forest, the largest recorded of these and other species exist. Their size is often exaggerated by heavy club mosses hanging in festoons from branches high above the forest floor. While it is certainly wetter here during the winter and spring months, it is no less impressive. You just need to wear boots and a rain jacket! If you are leaving from Sequim, we recommend you get an early start – head towards Forks by 8:o0 a.m. and you will get to the Hoh by 11 a.m., or before. Take a walk on the deep forest trail: “Hall of Mosses.” With the exception of a short steep bit at the beginning, this is an easy walk with a number of stops along the way. Pack a picnic lunch, or stop in Forks for a burger or something of the like before heading towards the coast and Rialto Beach. It will take you about 1.5 hours to drive there from Forks. Rialto Beach is just north of the mouth of the Sol Duc River and Quilleute Indian Reservation. Do some beach combing or sit on a beached log and contemplate the Universe. After a big trip like that, some wine tasting on the way home will be the perfect way to end an exhilarating day on the stunning Olympic Peninsula! The Olympic Peninsula is a visually stunning place with large areas of wilderness. This makes it an amazing place to visit. There is a lot to see and for someone that doesn’t know where to start, a tour can be a great way to see the Peninsula. We will use some of our winter posts to write about our favorite itineraries for touring the Olympic Peninsula. Explore some of the finest examples of the marvelous Peninsula ecosystem on a day tour to Lake Crescent, Marymere Falls, and Hurricane Ridge. Lake Crescent is a deep, blue lake carved out by glaciers 15,000 years ago. From the visitors center take an easy walk through a tall and verdant forest to Marymere Falls, a lovely cascade steeped in moss and ferns. Head back through town and up to the Heart O’ the Hills and wind your way up to the spectacular view from Hurricane Ridge, easily one of the most famous vistas in Washington. By the time you reach the top, you will have traversed from sea level to sub-alpine forest. From Hurricane Ridge, looking across the valley of the Elwha, far below, one can gaze upon the many snow-capped peaks of the Olympics, cloaked in glaciers. Black Diamond Winery: Hours ~ October, November, December: Saturday and Sunday 12 – 5 p.m. Closed in January, February & March. Address ~ 2976 Black Diamond Rd. Port Angeles. Harbinger Winery: Hours ~ Open Daily from 11a.m.- 6 p.m. Sunday ~ 11 a.m. – 5 p.m. Or by special appointment. Address ~ 2358 Hwy 101 West. Stop by on your way there or back to warm up in the tasting room with some delicious Washington wine, created in one of the most beautiful places in the nation! 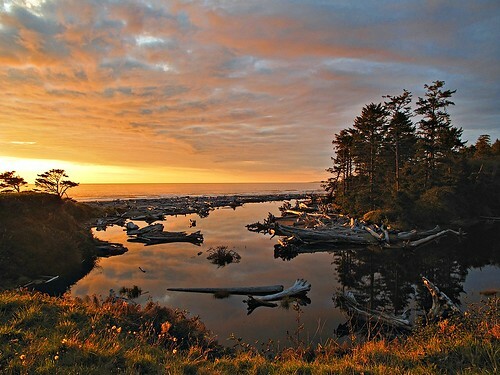 The Olympic Coast National Marine Sanctuary encompasses 135 miles of coastline. It’s located on the Olympic Peninsula, in the northwest corner of Washington State, and much of it is remote and wild. We’re fortunate to live and work so close to this national treasure. Sunset at Kalaloch, in the Olympic National Park. Many of the people who visit our 8 member Olympic Peninsula Wineries and Cideries are either coming from- or going to- the coast. They come from the greater Seattle area and they come from east of the Cascade Mountains. They travel from Canada and they come from points farther south and east. People are drawn to the Washington Coast. We’re not surprised. Some visitors want to walk to the tip of Cape Flattery, the most northwestern point in the lower 48. Others come to see the sea stacks off the beaches of La Push, or to hike from Ozette Lake to the coast. Some dream of running on the wide, sandy beaches of Kalaloch. Others dream of digging for clams on the beaches of Moclips. Whatever your reasons for visiting the Olympic Coast, we hope you’ll take time to visit some of the Washington State Wineries located on the Olympic Peninsula. Sample some of the wines made here, and when you find one you like, bring it with you. Share it while camping or bring it back home and, as you sip it, remember the magnificent Olympic Coast. Hurricane Ridge is truly a winter wonderland. You can cross country ski, downhill ski, snowboard, telemark, snowshoe and sled there. Novice winter sports enthusiasts will feel comfortable here, and experts can find a challenge. On clear days, the sun is warm and the views seem endless. Beautiful Hurricane Ridge, in the Olympic National Park. Rangers offer guided snowshoe walks out of Hurricane Ridge on Fridays, Saturdays, Sundays, and holiday Mondays at 2 p.m. Expect to be out for 90 minutes, and to donate $5 for the snowshoes and the talk. This is a great way to familiarize yourself with the area, and with safety issues. Once you feel comfortable walking on snow, the winter world of Hurricane Ridge will open to you. Nearby trails cover some 20 miles of the Olympic National Park. They run along ridges, parallel creeks, and head into valleys. The Switchback Trail is 1.6 miles long and goes from 4,400 feet to 5,900 feet. The Hurricane Ridge to Switchback Trail is 2.8 miles long and goes from 5,300 feet to 5,100 feet. The Lake Angeles – Klahane Ridge Trail spans 6.3 miles, going from 1,850 feet to 6,000 feet in elevation. The Heather Park Trail has the same elevations but is a touch shorter and steeper. If you live in the Seattle area, the snow-capped Olympic Mountains smile down on you on clear days. Get to know them more intimately. 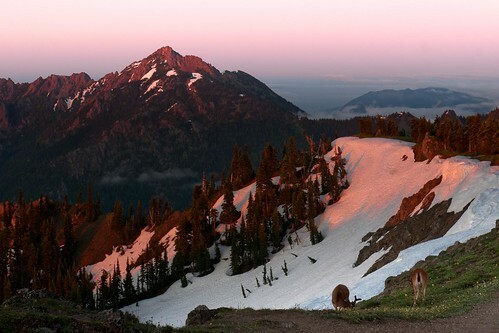 Spend a few days on the Olympic Peninsula and visit Hurricane Ridge. Sipping a glass of Washington State Wine from the Olympic Peninsula is the best way to conclude a day spent playing on Hurricane Ridge. Several wineries are located at the base of Hurricane Ridge, in Port Angeles. Stop by and try a glass or two.